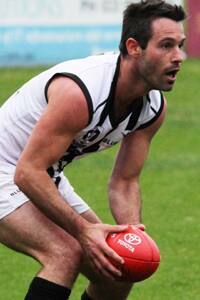 Alan Didak had 34 possessions in Collingwood's 60-point win over Sandringham on Saturday. Photo: Shane Barrie. Several of Collingwood's biggest names performed strongly in the VFL Magpies' 60-point win over Sandringham on Saturday. The win keeps the ninth-placed Magpies well and truly in the finals race with only one round of the home and away season remaining. Alan Didak played one of his best games for the year, winning 34 possessions, taking 10 marks and recording three rebound 50s. He could have singlehandedly put the Zebras to the sword had the wind not messed with his kicking for goal. Didak finished the day with a return of one goal and five behinds from the midfield. Ruckman Darren Jolly was terrific after a week off due to knee soreness. He had 24 possessions and took six marks but it was his 31 hitouts and three clearances that meant his onballers had the ascendency over the Zebras all afternoon. Fellow big man Ben Hudson morphed into a full forward but the new role didn't unsettle him for a second. He kicked four goals from seven marks and 21 possessions and still managed to contribute 14 hitouts for the afternoon when relieving Jolly. Also prominent were Ben Kennedy (30 possessions; 16 kicks, 14 handballs), Kyle Martin (24 possessions; 17 kicks, seven handballs) and Paul Seedsman (24 possessions; 20 kicks, four handballs). The one blotch on an otherwise flawless day was the injury sustained by Dale Thomas. In his return from ankle surgery, the Magpie star wore a heavy knock in the second quarter and took no further part in the game. "Dale received a knock to his ankle in a contest during the second quarter," VFL coach Dale Tapping told collingwoodfc.com.au. "We withdrew him from the rest of the match for precautionary reasons and I'm sure he will be assessed on Monday." Thomas had four possessions (all kicks ) and two inside 50s. Andrew Krakouer was a late withdrawal owing to a virus. Recap collingwoodfc.com.au's live coverage of the win in the module below. *Nick Holman (Murray Bushrangers) is the 23rd man this week.